In Russia very many lakes, and there are the biggest on earth, fresh water reserves. The lake is a lot of the fish that fishermen love to catch, combining the pleasant with the useful. 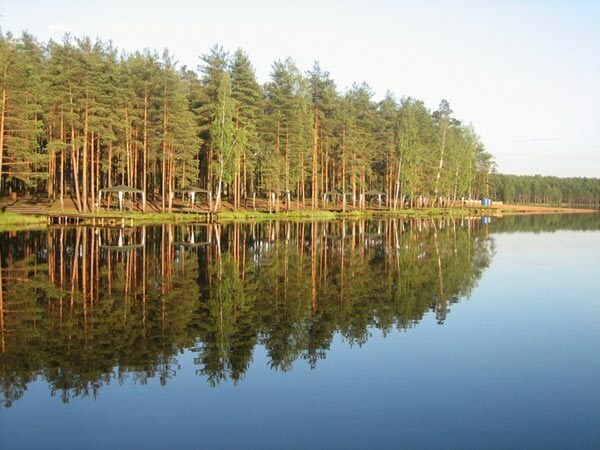 Very popular among fishing lovers enjoys beautiful Korkinskogo lake — from there will not leave without a catch. The fastest and most convenient way to get to Korkinskogo lakes is a plane. But will have to do a transplant for ground transportation. First, you need to fly a flight "Moscow — Saint-Petersburg". From the airport "Sheremetyevo" these flights are operated by airlines "Aeroflot" and "jet Air", from "Domodedovo" fly the aircraft "Ural airlines" and "Russia", and "Vnukovo" — planes "Transaero". After arrival to St. Petersburg" at the airport "Pulkovo" we need to take bus No. 259 and go to the stop "Korkinsky lake." Total travel time is 2 hours and 50 minutes. You can reach Korkinskogo lakes and on long distance train. Again with a connection. From the Leningrad station of the Russian capital every day leaves a few dozen trains on the route "Moscow — Saint-Petersburg". Upon arrival at the Moscow railway station you have to catch a bus "St. Petersburg — Vsevolozhsk" or "St.-Petersburg — Kirovsk" and go to the stop "Korkinsky lake. The route". The total journey time is 10 hours and 45 minutes. There is an easier way to travel to Korkinskogo lakes using long-distance trains. For this we need to take the special train "Sapsan", and on arrival at railway station or airport to get on the bus "St. Petersburg — Vsevolozhsk". You should get off at the stop "Korkinsky lake. The route". The total journey time is 5 hours 30 minutes. You can reach Korkinskogo lake by car. For this it is necessary to taxi on the highway M-10 Russia and go through Tver, Velikiy Novgorod and Pavlovsk. From St. Petersburg, turn right on highway P-21 Kola, which will bring to Korkinskogo lakes. The time on the road will be about 11 hours and 20 minutes. But just in case, if on highways and in large cities there is no congestion and traffic jams. If you are not lucky, it can last for 3-2 hours.